You've probably seen credit card promoting their lucrative credit card miles rewards programs. Or, you've read stories of people who fly around the world for next to nothing using credit card miles. It may sound like a gimmick, but it's actually possible to accumulate miles and use them to take trips. The number of miles you can earn and trips you can take with those miles depends on a few factors. Once you understand how credit card miles work, you may decide it's a benefit you want to take advantage of. Credit card miles are a type of loyalty benefit that certain credit cards give to customers as a reward for their credit card spending. The more you spend on your credit card, the more miles you accumulate. For example, a credit card might reward you with one mile for every dollar you spend on your credit card. The credit card issuer and airline partner defines a value for each credit card mile, like a penny per mile, for example. Once you've accumulated enough miles, you can redeem them for an award seat one of the credit card's airline partners. Airlines, not the credit card issuer, set the number of miles required for a flight. Depending on the number of miles you've accumulated and the value of each mile, you can use your credit card miles to get the flight for free. If you don't have enough miles for a flight, you may be able to purchase additional miles to make up the difference, effectively receiving a discount on the price. The number of miles required for a flight depends on where you're going and the price of the flight without miles. You might need anywhere from 12,000 to 40,000 miles for a flight. If your credit card miles are tied to an airline's frequent flyer program, you may be able to use your rewards to qualify for seat upgrades, priority boarding, free companion tickets, or other airline benefits. With airline frequent flyer programs, you typically only earn miles on your flights. So, unless you're actually a frequent flyer, it can take several months, or even years to accumulate enough miles for a flight. The attractive thing about credit card miles is that you don't actually have to fly to earn miles. You simply have to use your credit card. Before you can start earning miles, first you have to apply for a credit card with a miles rewards program. Nearly every major credit card issuer has at least one credit card with credit card miles. Review the offers from various credit card offers to decide which falls in line with your spending habits and your goal for earning credit card miles. Keep in mind that you typically need to have excellent credit to qualify for the best rewards credit cards. Some credit cards do reward your travel or other categories of purchases with a higher number of miles, which is a plus if you are fly frequently. Spending more in these categories will help you earn credit card miles faster. Credit card miles can be taken away, even after they've been added to your account. For example, if you return a purchase, any miles earned on that purchase will be deducted from your miles balance. You can also lose your credit card miles if you fall behind on your payments and your account is no longer in good standing. Unfortunately, you won't get your forfeited credit card miles back once you bring your account back into good standing. So it's especially important to stay on top of your credit card payments on any credit card that you've earned credit card miles. How Can You Check Your Credit Card Miles Balance? If you're saving up credit card miles for a trip you want to take or you just want to keep up with the miles you've accumulated, you can check your credit card miles balance on your most recent billing statement, by logging into your online credit card account, or by calling your credit card issuer. It may take a few days after you've made a transaction for miles to credit to your account. Your credit card issuer's customer service can answer questions about any miles that may be missing from your account. It's also important that you protect your credit card miles from theft. Thieves who gain access to your account can redeem your miles. If you're not paying attention, you may not notice for several months. You can protect your credit card miles by making sure you have a strong password on your credit card account. The best passwords include both capital and lowercase letters, at least one number, and one character. Avoid using your passwords across websites. Check your miles balance often and notify your credit card issuer if you notice anything suspicious. They'll e able to track down any missing rewards, let you know whether they were redeemed, and credit them back to your account in the event of any unauthorized use. How Do You Redeem Your Credit Card Miles? Once you've accumulated enough credit card miles, you can redeem them for an award seat on a flight. Keep your schedule flexible if you're redeeming credit card miles for your flight. Airlines usually only have a certain number of award seats on each flight. Or the number of miles for flights may differ depending on the flight's day and time. Depending on the miles program, you may be able to combine credit card miles or transfer between airlines. Make sure you pay attention to the fine print with combining and transferring miles. Sometimes you may lose miles in the conversion between programs. The exact method for redeeming credit card miles depends on the credit card you're using. 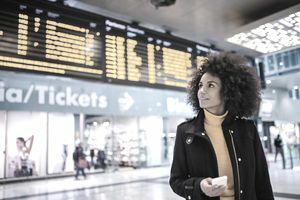 When you're purchasing your flight through your credit card issuer's booking tool, you'll typically be given the option to use your credit card miles directly for the flight. You may be able to redeem your rewards on the same online site that you check your credit card balance and pay your bill. Or, your credit card issuer may have a separate website for redeeming your credit card miles. For example, American Express has American Express Travel, Chase has Ultimate Rewards, and Citi has its Thank You rewards portal. Check with your credit card issuer or read through your credit card benefits guide to find out the specific steps you should take to redeem your credit card miles. Some credit cards allow you to redeem your rewards retroactively as a credit to your credit card billing statement. You have to make the redemption within a certain amount of time after the travel-related transaction posts to your credit card account. Is Earning Credit Card Miles Worth It? Credit card miles are absolutely worth it, especially when you consider that you don't have to do anything extra to earn credit card miles. As long as you choose the right credit card, you can spend as you normally spend and earn miles. Most credit card miles don't expire and there are often no minimum redemption amounts which give you a lot of freedom and flexibility to build up your credit cards miles account then redeem your rewards when you're ready. If you really want to build up your credit card miles quickly, replace your normal debit card activity with your credit card. You'll earn miles much faster than if you only used your credit card here and there. Just make sure you pay your balance in full each month so you're not charged any interest. Paying interest on any type of credit card rewards offsets the rewards you've earned, especially on higher balances.